Peek inside a 2017 Hyundai Tucson and you'll find a spacious cabin with plenty of room for both driver and back seat passengers. The Tucson is built for real life, with a quiet cabin to minimize road noise, comfortable seating in both front and back seats, and features like stain-resistant fabrics to make real life seem less challenging. One of our favorite features? Folding back seats to transform the Tucson into a cargo-hauling beast, with an impressive 62 cubic feet of cargo space. The Honda HR-V's clever magic seat system gives you 60 cubic feet to manage cargo, quite a bit for an SUV of its size. Unfortunately, those magic seats don't transform the leg room in front or head room in back to something that passengers enjoy. The HR-V offers a nice compact, with an upscale interior, but compared to the Tucson it can't quite compete. Tech lovers rejoice--the Hyundai Tucson now offers Apple CarPlay and Android Auto in some of its 2017 models. The features in the Tucson will give you what you need and expect in a vehicle of this type--rearview camera and Bluetooth- and USB-equipped audio system. 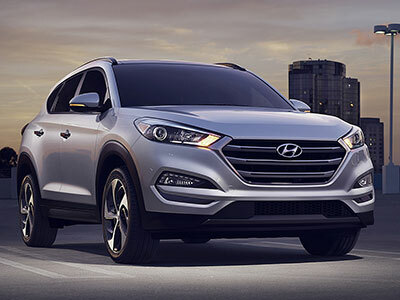 If you're looking for more, the Tucson allows you to customize your SUV with plenty of other cool features, like a smart power tailgate, leather seating, ventilated front seats and heated rear seats, lane-departure warning, panoramic sunroof, rear parking sensors, and automatic emergency braking with pedestrian detection. If you need something, Hyundai probably has a way for you to get it--something that can't always be said of SUVs of this class. 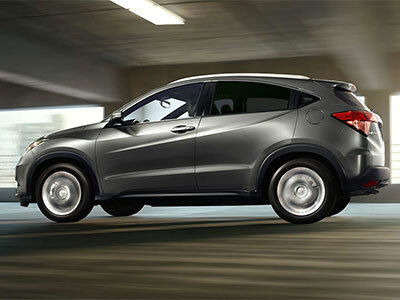 The Honda HR-V offers buyers its HondaLink infotainment system on a 5-inch touchscreen display. Sadly, the HondaLink has a reputation for being notoriously slow and, in some upper trims without knobs and buttons, difficult to use. Other standard features on the HR-V match the Tucson's: Bluetooth, USB port, four-speaker sound system, and multi-angle rearview camera. The Hyundai Tucson has elegant handling and sufficient power for daily driving, but, because it's bigger than some of its competitors, pays for it at the pump. For its class, the Tucson's numbers of 25 mpg in the city and 31 highway miles per gallon are not bad at all--but they won't dominate among peers. The 2017 Honda HR-V does a bit better than the Tucson in terms of fuel economy, with the same number of city miles per gallon, but 33 highway miles. Some critics complain about noisy acceleration, but that's likely standard for compact SUVs and the HR-V performs well for its class. The Hyundai Tucson earned a Top Safety Pick distinction from the Insurance Institute for Highway Safety and a perfect five stars overall in government safety ratings. Hyundai offers additional safety features as well, including all of these: automatic emergency braking, forward collision warning, pedestrian detection, lane departure warning, lane change assist, blind spot warning, and rear cross-traffic alert. The Honda HR-V also earned a five-star rating from government tests but didn't do quite as well in IIHS testing. You'll notice far fewer active safety features among its options, but it does offer vehicle stability assist with traction control, ABS brakes, brake assist, and multi-angle rearview camera with guidelines. The Hyundai Tucson is the SUV to beat in this comparison. In tech, safety features, and comfort, the Tucson comes out on top. More cabin and cargo space and a better all-around performance make the Hyundai Tucson your best buy. Come see for yourself!